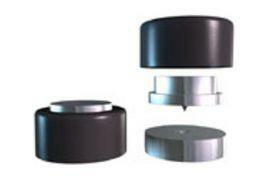 Self-aqdhesive spike foot for loudspeaker cabinets. This unique construction eliminates the most common problem experienced when using a conventional spike: damaged surfaces. The construction is based on a high quality spike fitted with a custom designed base plate, all integrated in a plastic housing. This allows the user to move the equippment without making scratches and scars to the surface. For every loudspeaker cabinet 3 feet (1 package) are necessary. Price is per foot.